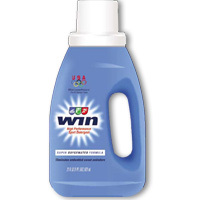 WIN's super-oxygenated formula breaks down sweat and bacteria, washing away deeply embedded, odor-causing residue. It's safe for all colors and fabrics and leaves the sweatiest clothes deep down clean and fresh. We were very skeptical when WIN's manufacturer first approached us with this product. After all, we didn't think we had a "problem" with our regular detergent. Our workout clothes looked clean enough, and we didn't see any reason to change. However, our first test changed our minds about this product. We had a few favorite pieces of workout clothing that smelled pungent as soon as we began to sweat, despite prior repeated washings. After one washing with WIN, however, these items were noticeably cleaner and odor-free. WIN outperforms all conventional detergents, because it completely destroys the source of sweaty odors. High-tech synthetic fabrics have revolutionized performance sportswear, because they wick sweat away from your body to keep you cooler and drier. Unfortunately, though, these same high performance fabrics also trap sweat and bacteria. Conventional detergents remove most dirt and stains from the surface of these fabrics, but can't penetrate the core of the fabric's tightly woven microstructure. The only effective way to remove the trapped residue and odor-causing bacteria is with a detergent formulated to specifically attack sweat molecules. WIN is that detergent. Two independent laboratories have confirmed that it outperforms the leading detergents on removing sweat and odor from fabrics. Put WIN to Work on Your Sweaty Clothes! 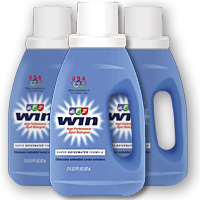 Each bottle of WIN liquid detergent cleans approximately 14 full loads of laundry. It's safe to use on all colors and fabrics, and works equally well in all temperatures. WIN detergent can be used for both hand and machine washing, and is biodegradable (based on OCED standards). Better Fitness Products no longer sells WIN Detergent, but you can now Buy it Here and from some local retailers.